International Journal of Life Science Study (ISSN: 2329-6119, eISSN: 2329-6100) is an open access and peer reviewed International Journal which is dedicated to publish high-quality articles dedicated to all aspects of the latest outstanding developments in the field of Life Sciences. 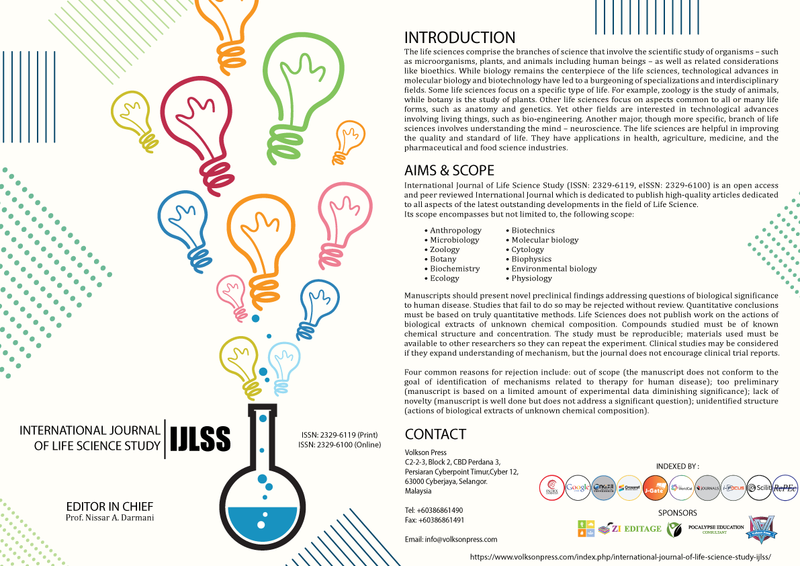 International Journal of Life Science Study (IJLSS) is a collaborated publishing project under Zibeline International and Academic Research Publishers. The life sciences comprise the branches of science that involve the scientific study of organisms – such as microorganisms, plants, and animals including human beings – as well as related considerations like bioethics. While biology remains the centerpiece of the life sciences, technological advances in molecular biology and biotechnology have led to a burgeoning of specializations and interdisciplinary fields. Some life sciences focus on a specific type of life. For example, zoology is the study of animals, while botany is the study of plants. Other life sciences focus on aspects common to all or many life forms, such as anatomy and genetics. Yet other fields are interested in technological advances involving living things, such as bio-engineering. Another major, though more specific, branch of life sciences involves understanding the mind – neuroscience. The life sciences are helpful in improving the quality and standard of life. They have applications in health, agriculture, medicine, and the pharmaceutical and food science industries. International Journal of Life Science Study is an international journal publishing articles that emphasize the molecular, cellular, and functional basis of therapy. The journal emphasizes the understanding of mechanism that is relevant to all aspects of human disease and translation to patients. All articles are rigorously reviewed.The Journal favors publication of full-length papers where modern scientific technologies are used to explain molecular, cellular and physiological mechanisms. Articles that merely report observations are rarely accepted. Recommendations from the Declaration of Helsinki or NIH guidelines for care and use of laboratory animals must be adhered to. Articles should be written at a level accessible to readers who are non-specialists in the topic of the article themselves, but who are interested in the research. The Journal welcomes reviews on topics of wide interest to investigators in the life sciences. We particularly encourage submission of brief, focused reviews containing high-quality artwork and require the use of mechanistic summary diagrams. 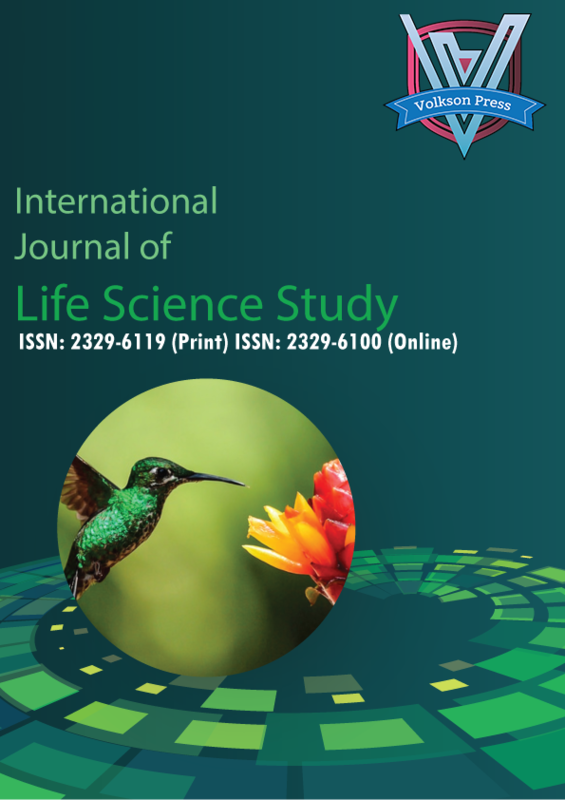 International Journal of Life Science Study (ISSN: 2329-6119, eISSN: 2329-6100) is an open access and peer reviewed International Journal which is dedicated to publish high-quality articles dedicated to all aspects of the latest outstanding developments in the field of Life Science. Manuscripts should present novel preclinical findings addressing questions of biological significance to human disease. Studies that fail to do so may be rejected without review. Quantitative conclusions must be based on truly quantitative methods. Life Sciences does not publish work on the actions of biological extracts of unknown chemical composition. Compounds studied must be of known chemical structure and concentration. The study must be reproducible; materials used must be available to other researchers so they can repeat the experiment. Clinical studies may be considered if they expand understanding of mechanism, but the journal does not encourage clinical trial reports. Four common reasons for rejection include: out of scope (the manuscript does not conform to the goal of identification of mechanisms related to therapy for human disease); too preliminary (manuscript is based on a limited amount of experimental data diminishing significance); lack of novelty (manuscript is well done but does not address a significant question); unidentified structure (actions of biological extracts of unknown chemical composition).